We’ve been warm here on the coast for the past few days, but also rainy. Based on all the cold that we’ve had, you’d think that nothing would be growing anywhere, but you might be surprised to find that a lot is growing across the country right now. For example some areas have beautiful white cauliflower growing and others have woody and meaty mushrooms popping out of the dirt. 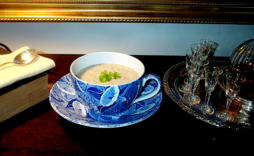 Now, I know that growing mushrooms is not a “usual” crop but if you have some around or if you grow them, I’ve included a delicious Portabella Mushroom soup for you to try. And, if you have white cauliflower right now, there is a recipe for Cauliflower-Pecan Casserole that I hope you’ll enjoy for a Saturday or Sunday dinner or just hold on to the recipe and use it for your holiday dinner coming up soon. If there is anything that you’d like to see a recipe for, by all means let me know. In the meantime, I hope you’ll enjoy the recipes for this week. In a large saucepan, sauté green onions and mushrooms in the butter until the mushrooms are cooked. Stir in flour and cook for about 2 minutes more. Gradually add the milk and broth to the mixture, stirring well. Cook over low heat for 10 minutes or until thoroughly heated and thickened, stirring constantly. Puree in a blender, food processor or a hand-held emulsifier. 4 servings. Place the water and salt in a large pan and bring to a boil. Add the cauliflower and let the water come back to a boil. Lower the heat and simmer until the cauliflower is tender. This will take about 10 minutes. Drain the cauliflower and place in a buttered baking dish. Preheat the oven to 400º. Mix the Cheddar cheese, sour cream, flour, chicken broth, and mustard together. Pour over the cauliflower. Toss the pecans and bread crumbs with the butter, marjoram, and garlic and sprinkle on top of the cauliflower. Bake until casserole is bubbly and cooked thoroughly. Serves 6-8.